There are many great reasons to do a community share issue, but amidst the burgeoning field of new and innovative ways to raise money, our number one reason to recommend community shares is a simple one. This isn’t just our view – it’s backed by research commissioned by NESTA from Cambridge University. They looked at a range of ways organisations can raise capital and discovered that community shares raise about 10 times what people will donate. For example, FC United’s new stadium was funded in part through a £2M share issue, which is one of the largest to-date, with an average of £400 per investor, and that sum is typical of many share issues. That’s because of the second finding. People were asked what they would have done with the money they invested/donated/crowdfunded instead. 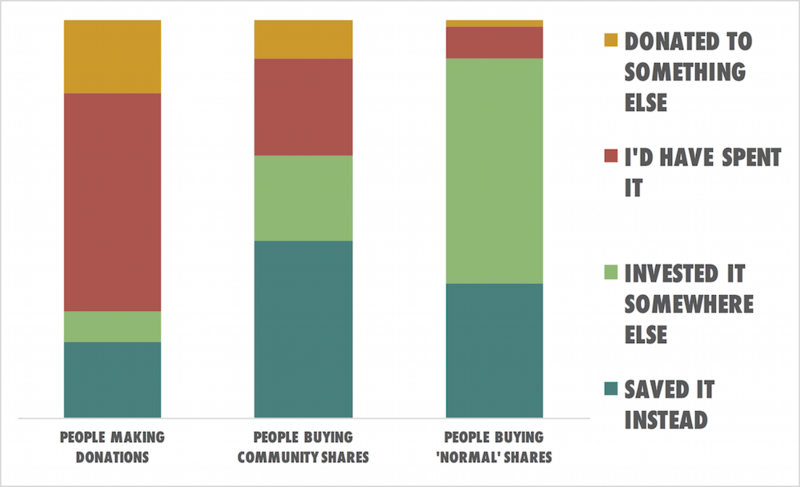 Community shares comes disproportionately from people’s savings, whilst donations comes from people’s disposable income. That means that when people donate, they give what they can afford to ‘reintegrate’ into their day-to-day spending. They’ll give what they can see a way to save later on – maybe not go to the pub one night or not order that takeaway they normally have on Fridays. Conversely, community shares are about selling ownership, which has a real tangible value that people will pay for. You’re selling a long-term investment which will provide a social and financial return. If you get the pitch right, you get people tapping into their savings. The right offer makes people not want to keep flagyl their money for some unspecified thing in the future (usually in a low-interest paying bank account where it might be invested in all sorts of things they don’t support) and instead give it to you to make something very specific happen in the here and now. That’s the challenge but it’s also the opportunity. The Financial Conduct Authority (FCA) did a survey of the UK savings market in January 2015 and discovered there was £1.2 trillion pounds in UK savings – that doesn’t include pensions, stocks and shares, or housing equity. That’s an astonishingly large number – if you counted a pound for every second, and didn’t stop counting, you’d get to a million in 11 days. You’d get to a billion in 31 years. It would take you 38,000 years to count to the UK savings market. The FCA found that around 25% of that was in low-interest accounts earning 0.50% or less. That’s another reason why community shares offer such an opportunity – since the crash in 2008, there’s an awful lot of money sitting in bank accounts earning very, very little due to historically low-interest rates. Against that backdrop, you don’t have to work too hard to offer as good a deal (or better) than the banks, and if you can connect the values of your enterprise and the change the investment will make in the world with those of a supportive community, then the sky’s the limit.